In October 2007 Reliance Anil Dhirubhai Ambani Group has joined hands with One Laptop Per Child (OLPC) Foundation to help kick start the OLPC India project to help bridge the divide between the people who have access to information and technology. The first of the XO laptop series was distributed in Khairat village, Khairat School is just around 3KMs from Karjat Chowk as you drive in the direction of Matheran. The school has 25 children and since it is a very small school, children from Class 1to 4 all study in the same room, the teacher has to multi-task and shifting his attention from one class to another. Rahul proudly showing off his OLPC XO Laptop, the horizontal bands on the XO screen show the kids who have logged into the chat using the XO's mesh network. Rahul is one of the brightest kids at the Khairat School and he is quite passionate about his laptop. He does not let anyone touch it or even give him a demo on his own laptop, you have to give him a demo on another machine and he will follow. Sandeep Surve, the teacher of the Khairat School, his enthusiasm and passion for learning the OLPC have made a major difference to the project. 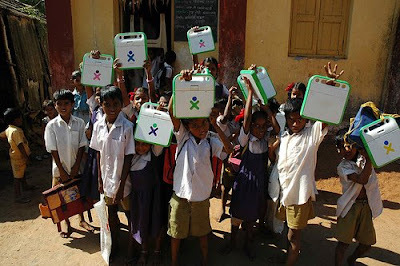 The entire OLPC India, Khairat Chronicle has been documented online by Carla Gomez Monroy who works with them. In recent times there’s been a number of new developments which all indicate that OLPC is gaining significant momentum in India. First in mid-July it was announced that XOs bundled with CDMA modems are expected to hit retail stores later in the year. Additionally OLPC India’s page on wiki.laptop.org now mentions an additional 5 deployments going on at the moment. Kudos to everyone involved in making this a successful initiative, equal opportunity for everybody that is the future along with socially responsible corporations! Whenever the government takes land away from the locals it seems like they never live up to their promises like the Tata Nano project in Singur, but we do not need to look far take a look at the Morbe dam project in Karjat that has affected 11 villages and 776 families. According to an outdated census around 2897 people have been affected by the dam. Some of the affected people have been claiming that they have not been given permanent jobs as promised while none of the families who have been resettled get water from the dam. The villagers currently have to get water from taps located far away from their house, Vasudev Rane, an affected villager, said, "It gets worse in summers and we are supplied with water from tankers. Records show that the Navi Mumbai Municipal Corporation (NMMC) has excess water. Why can't they lay small pipelines to our houses? After all, the Morbe dam is built on our land." Devendra Satam, MLA, Shiv Sena, Karjat, said, "The government had promised jobs to 58 project-affected youth. When the NMMC took over, they said they were not obligated to provide jobs. I met the Navi Mumbai municipal commissioner, who only confirmed NMMC's stand." While the local Shiv Sainiks stated that they would intensify their agitation and shut off the water supply from the dam if the NCP controlled NMMC continued to treat the villagers in such manner. But the Navi Mumbai municipal commissioner V S Nahata stated that the previous owners of the dam the Maharashtra Jeevan Pradhikaran (MJP) had entered into a deal with the villagers and the NMMC was not bound to provide jobs. The NMMC had bought the dam from the MJP who had promised the villagers jobs. "Despite this, we have employed these villagers on contract and pay them wages as per our standards, which are the highest in the country," added Nahata. According to Nahata the NMMC had supplied water to houses of 400 people who were complaining and are open to hearing the problems that other villagers are facing. 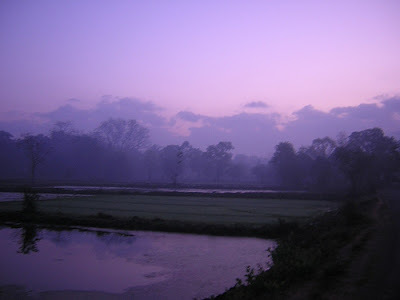 The area is surrounded by lofty peaks, dense forests and is also the source of River Bhima. There is also Bhimashankar Sanctuary where variety of birds, flowers and animals can be seen. From Karjat station you need to travel to Khandas village, which is around 40 kms away, either by ST bus or tumtums, plying between Khandas and Kashele. Ganesh Ghat –There is a bridge around 2 km from Khandas, and the track going to the right from the bridge is the Ganesh Ghat route. This is the easiest and the longest route to Bhimashankar. Within an hour of trekking along this route you will reach a Ganesh temple. Enroute you will pass the base of Padar Killa, you can combine the two treks but ensure you have a villager to guide you and you are well-equipped since the route to Padar Killa is confusing and at some places you will require a rope to climb. Moving ahead there are few tea stalls to catch you breathe. The route ahead will take around 3 hours until you reach the plateau of Bhimashankar, there is a small pond dug out in the ground called 'Hanuman Tal'. This trek is five and hours to six hours long. Shidi (ladder) Route – This one is a short route, but very steep and difficult especially in the monsoons. The route gets its name from the ladders placed on the steepest parts. The route going to the left of the bridge (mentioned in Ganesh Ghat) goes to the village. On moving ahead you will reach a well, take a left from there to Shidi ghat. Within the first two hours of climbing you will pass the three ladders. 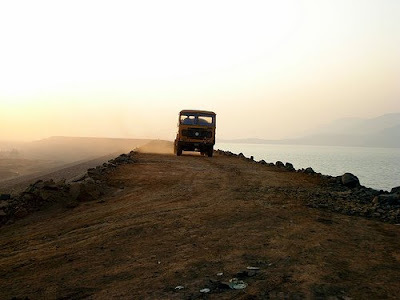 You will reach a junction where both the routes - Ganesh ghat and Shidi – merge. That’s where you can take a break for a cup of tea. In another hour and half from here you will reach the temple. The temple is commercialized due to road route leading to Bhimashankar, through the Pune–Talegaon– Chakan route. The temple dates back to the 18th century, with some intricate carvings adorning the pillars and door frames. Just opposite the main temple, there is a small shrine dedicated to Shani (Saturn), and outside that hangs a huge Portuguese bell, a war relic symbolizing the victory of Marathas over the Portuguese in the Battle of Bassein in 1739. After seeing the temple you can go to the Hanuman Lake, Nagphani Tok (point) or Serpent's hood, Gupt Bhimashankar, origin of River Bhima, Bombay Point and Sakshi Vinayak. Nagphani Point is the highest point in Bhimashankar, and called that because its shape is like a cobra’s hood. So you will get to see the surrounding hills and forts of the Matheran range and Padar killa down below. The dominant species of flora are Mango, Jamun, Hirda, Behda, various medicinal herbs, Bamboo and fern. The Giant Indian Squirrel is one of the major attractions of the sanctuary. The other species found in the dense forests are Sambar, Barking Deer, Hyena and the Wild Boar. If you love bird-watching, then you will be able to find Malabar Grey Hornbill, Quaker Babbler, Malabar Whistling Thrush, Green Pigeon, and so on. In case you want to spend a night, few motels like Mansarovar and forest rest house are available or you can camp on open flat spaces near the temple. The Maharashtra Government has been asked by the Bombay high court to provide the necessary infrastructure to open a court of additional sessions and district judges at Panvel in Raigad district. This would make it convenient for litigants from Karjat, Panvel, Uran and Khalapur, who currently travel to Alibaug session court for redressal of legal issues. 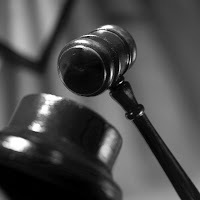 Since Alibaug is quite far from these places, litigants face tremendous difficulties in traveling. The direction of Bombay high court was issued after residents of Panvel filed a Public Interest Litigation (PIL) due to the failure of the state government to open a court for redressal of legal issues in that vicinity. 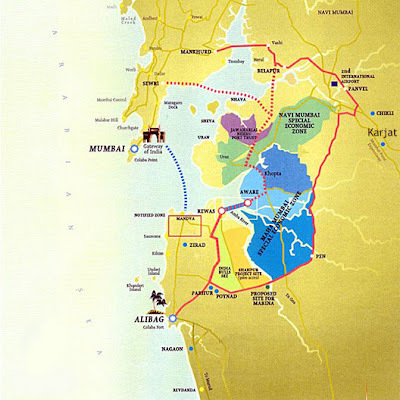 Currently, around 50% of the litigations in Alibaug court arise out of these four places. Bombay high court had given their approval to open a court way back in 1992, but the Maharashtra government failed to take any action. 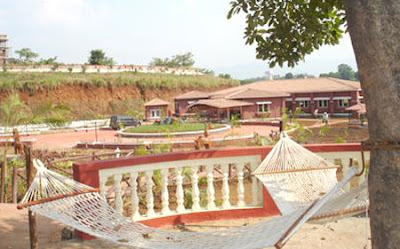 Prakruti Farms, located 11 km from Karjat station, has facilities for all occasions, groups, individuals and families who wish to spend time in the heart of nature. Surrounded by the Sahyadri range, the farm is spread across 12 acres consisting of fruit orchards, vegetable farm and flower beds. 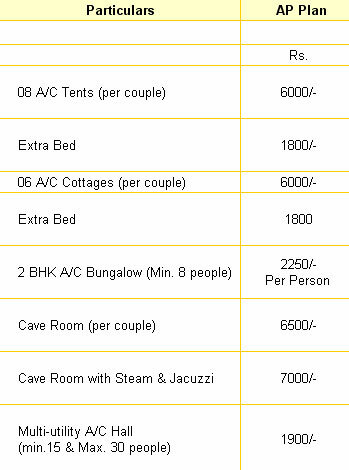 Prakruti farms offers well-furnished tents, cottages, cave rooms and bungalows. They have multi-utility halls for conferences, seminars, weddings etc. Guests can also go trekking to Rajmachi hills, starting very close from the farms, or visit Lena Caves built by the Pandavas. 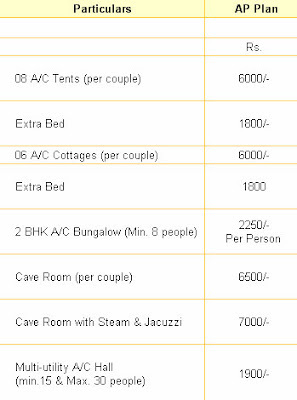 The rates are inclusive of 3 meals plus evening tea/coffee, and 15% tax on the overall rate. First Floor, office no. 3, Near Metro,Dhobi talao, Mumbai 400 020. Karjat is well-known for trekking, as each route gives a glimpse into the rich history of the Mogul era. We haven't been to any of them as yet but plan to go there soon, because there are several forts in and around Karjat waiting to be explored. One of them is the fort of Peth, also known as Kothaligad, which is around 21 kms north-east of Karjat in Shahapur taluka. The fort derives its name from the village Peth, situated at its base camp. Its a small fort used more as a defense station during Sambhaji's era, and is surrounded by other forts like Bhimashankar, Padargad, Rajmachi and Siddhagad. In about two hours, you reach Peth village, nestled right at the foothills of the fort. Another trek starts from the village to the fort, its a steep climb up, but from that point the path bifurcates into two - an easier path on the left and the steeper path on the right which will get you faster to the top. How to reach Peth Fort (Kothaligad) in Karjat? You can either reach Peth from Ambivli village, as mentioned above. Another way is from Jambrukh village, take a bus from Karjat station to Jambrukh village, from there walk on a bridge to a hamlet called Devpada. Ask any villager to show you the start of the route and you are on your way. The route is entirely through the forest without any openings. Its a continuous ascent and can get exhaustive in summer. It will lead you to the plateau where Peth village is situated and from there it finally meets the route mentioned above. Piccadilly Country Club & Resort is located in Mircholi village in Karjat, is a three-star category resort located 85 kms from Mumbai. 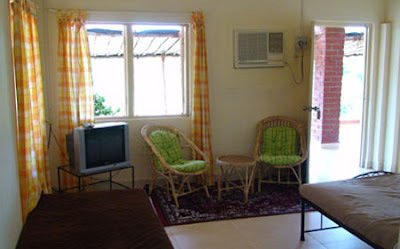 Piccadilly has well-furnished AC cottages equipped with TV sets, bathtubs and a view of River Pej. It can accommodate 4 adults. 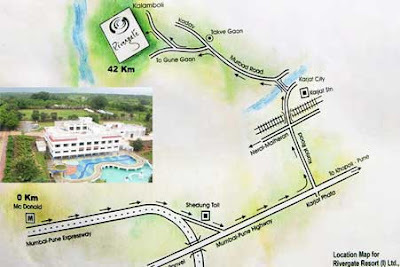 Like all resorts in Karjat, Piccadilly offers conferencing facilities for 30 people. All modern amenities from projectors, laptop & cordless microphones can be provided. It also has a Criterion Theatre, a multipurpose hall, with a capacity of more than 400 people. It is ideal for one day conferences, wedding, banquets or film shootings. The theme restaurant Pic-a-thali is open 18 hours a day, and serves authentic India fare & all kinds of snacks. Piccadilly Resorts also features a swimming pool and gym. After a workout session, guests can get refreshed with a hot steam bath. Or you can play a game of lawn tennis, or stay indoors playing table tennis, snooker, carrom or chess. 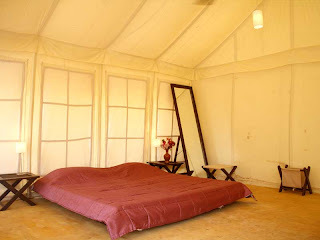 Apart from a resort, Piccadilly offers vacation homes, of 1200 sq.ft. built up area in a 3000 sq.ft. plot. Bungalows come with landscape gardens, electricity and water connection. 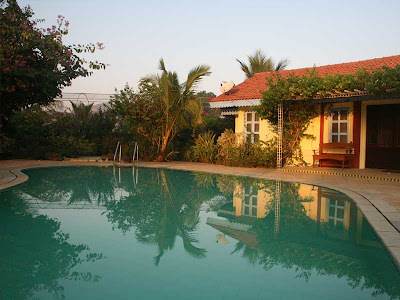 Around 3-4 years ago there were very few hotels and resorts in Karjat. Its only in the last two years that several hotels resorts have sprung up. 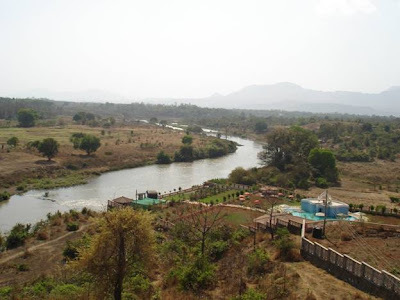 We spoke about Dr Modi's Resort and Satya Resort, another place to stay in Karjat is Rivergate Resort. Apart from accommodation, Rivergate boasts of open-air theatre, manicured lawns and banquet halls to host functions, parties etc. To relax and rejuvenate, the resort has a health club, where guests can use the steam, sauna and jacuzzi Facilities, along with a gymnasium. The resort has a range of activities for the guests to enjoy. The indoor activities include carom, chess, pool table, card room, table tennis and video game machines. To keep the guests physically active, the resort also provides host of outdoor activities such as cricket, badminton court, lawn tennis court, volley ball and basket ball courts. 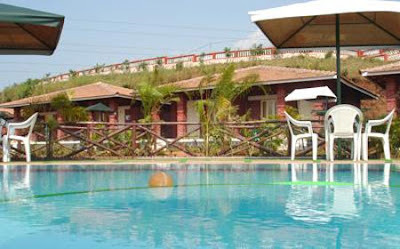 Rivergate also includes a swimming pool for adults and a mini pool and water slides for kids. Above rates is inclusive of tax. Karjat has been warming up as a destination for the city dwellers around it, but is Karjat ready to become the entertainment hub of Maharashtra. At the moment there has been a lot of development with regards to hotels and guest houses as Matheran, Khandala, Lonavala, Bhimashnakar Temple, Malsej Ghat, Alibaug beach etc. are around a 1 hour drive from Karjat. The Mumbai Trans Harbour Sea Link that will connect Sewri to Nhava Sheva will be completed by 2013 and will save the amount of time it takes to get to Navi Mumbai that may cause more people to come to this Green Wonderland. While some developers expect the land rates to go up considering the airport is only 27 kilometers away from Karjat. Three Secure Economic Zones twenty kilometers away from Karjat, located in Panvel are expected to boost the demand for houses here. MMRDA has planned to develop a part of area in Karjat-Khopoli belt as a Recreational Hub, on horizon are the Twenty20 league grounds, a Paint Ball Park, Theme Parks and Amusement Parks. 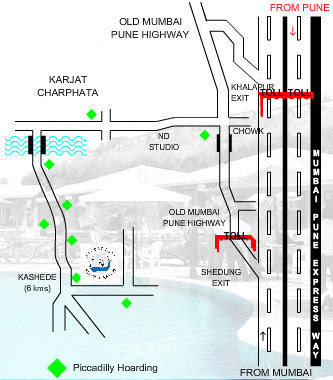 Not only has ND Sudio in Karjat become a major attraction, it has served as a catalyst for other national and international players to start up their own studios around the area. Greg Norman a world renowned Golf Course designer plan on starting a 27-36 Hole Super Championship Golf Course, the first fully-integrated golf and residential community to be developed outside Mumbai. Serviced by a 5plus star golf and country club and hotel, residents and guests will be offered a range of leisure opportunities. Its due to begin construction from next year onwards. With people dying to get out of the city there has been purchases of land here to set up farm houses, small and big. The list includes many celebrities like Ajay Devgan, Salman Khan, Shankar Mahadevan etc. When you put all these factors together, you can picture a very different Karjat in the coming years, we just hope it still stays one with nature.